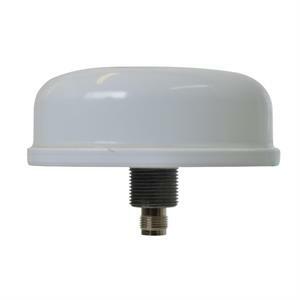 MobileMark NT-1575 GPS Timing Antenna can be used for a wide variety of applications including network synchronization in equipment cabinets and cell towers, geographic surveying, railroad track-side electronic shacks and agri-business planting. The antenna is housed in a rugged and weather-resistant radome that has undergone rigorous temperature, moisture, shock and vibration testing. The interior of the antenna is completely sealed with high impact foam. The radome is made from UV resistant ASA plastic. It will resist impact and will not discolor from the sun or elements. The antenna can also be configured with combinations GPS & Glonass; specify a “G” after the model prefix “NT”.